Dear Public, I, John Martin, write to you now from the Isle of Man wherefrom I shall soon depart you, to these Plains of Heaven. In this bed of death I am sinking and yet I feel my very end will be both tranquil and beautiful. I would wish you all such a peaceful end. My friends, I have tried my best to serve you and to serve my good wife, Susan, who has born me six fine children. We have slaved together throughout thick paint and thin. We have encountered joy and suffering. Joy in my success in bringing my visions to you men and women of high esteem throughout the world. Suffering in the deaths of three of our young children, in the suicide of my nephew Richard and other family pains. Through all this I have endeavoured to round and ground myself. 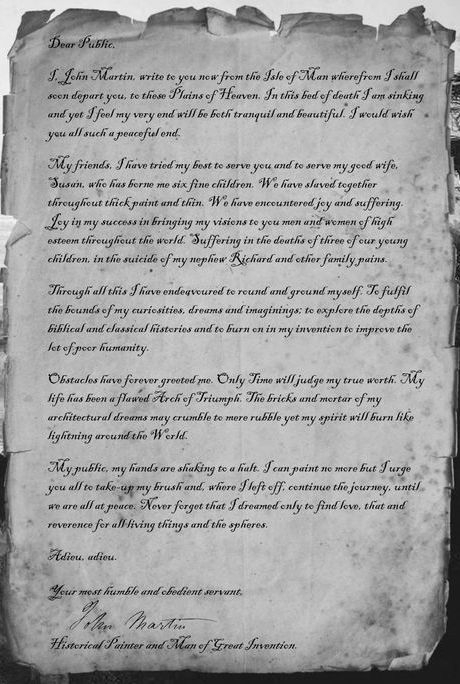 To fulfil the bounds of my curiosities, dreams and imaginings; to explore the depths of biblical and classical histories and to burn on in my invention to improve the lot of poor humanity. Obstacles have forever greeted me. Only Time will judge my true worth. My life has been a flawed Arch of Triumph. The bricks and mortar of my architectural dreams may crumble to mere rubble yet my spirit will burn like lightning around the World. My public, my hands are shaking to a halt. I can paint no more but I urge you all to take-up my brush and, where I left off, continue the journey, until we are all at peace. Never forget that I dreamed only to find love, that and reverence for all living things and the spheres. The Plains of Heaven [oil painting], John Martin, 1824. Tate Britain. 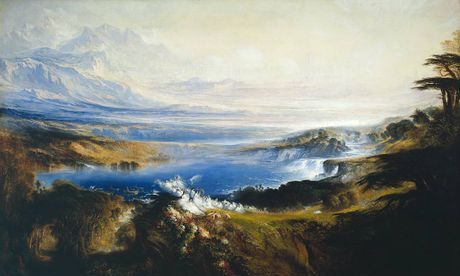 John Martin’s final exhibited paintings, in 1852, were an oil painting and two water colours, forming a trilogy, the ‘Judgement’ pictures, comprising ‘The Last Judgement’, ‘The Great Day of his Wrath’ and ‘The Plains of Heaven’. On November 12th 1854, he suffered a paralytic seizure while painting, causing him to lose his sight and the use of his right hand. Before long, he had lost the use of all his limbs and was struggling to eat. He died on February 17th 1854, and was buried in a private vault at Kirk Bradden Cemetery in Douglas, Isle of Man. John Martin had earlier written to Haydon Bridge Parish Council offering a collection of his works to form the basis of an art gallery. There was no reply for several years until the new Parish Clerk came across the letter and wrote to accept. The letter was delivered on the day John Martin died.